For centuries turf or peat has been an integral part of Irish history and culture and it is used as a source of fuel to this day. Turf is harvested from areas that are known as the boglands; these areas of Ireland possess a rugged beauty that has inspired generations. Turf is a wonderful and unique product of the land that has evolved into a fine medium of artistic expression that enriches the links of our Celtic heritage and cultural identity. 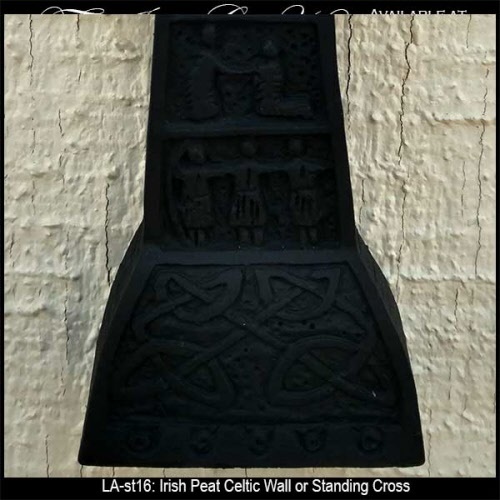 This Celtic cross is carved from Irish peat and features a design that is similar to the Muiredach High Cross located at Monasterboice, Ireland that includes Celtic knots. The turf cross measures 3" wide x 6" tall and is gift boxed with Celtic knot, Celtic cross and Irish turf history cards, complements of The Irish Gift House. 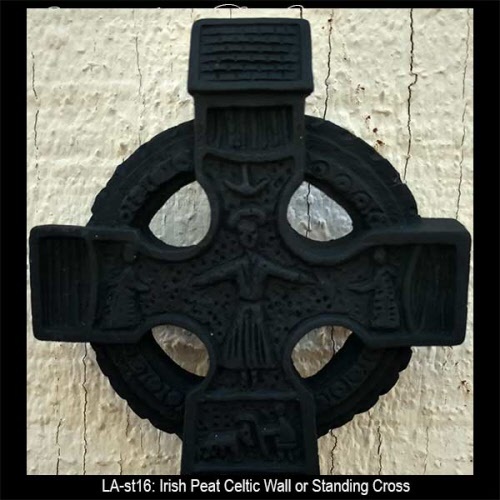 This Celtic cross is ready to hang on the wall or stand and it is made in Ireland by Liffey Artefacts. Standing Celtic cross is an Irish turf design that is enhanced with hand carved knot-work on both sides. 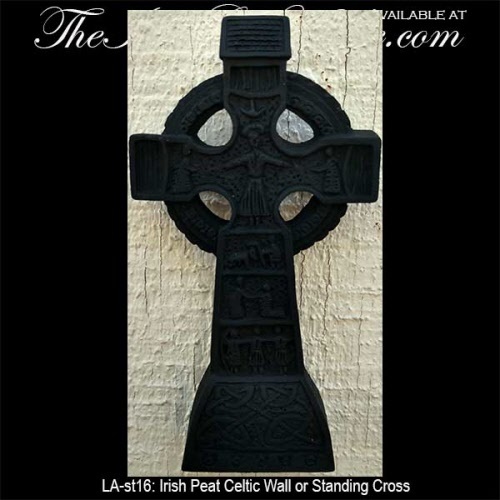 Celtic wall cross is hand carved from Irish turf and features a knot-work design.